Serge Alexandrovich Tcherepnin (b. 1941) is an American composer and instruments designer, creator of the famous Serge Modular synthesizer, son of pianist-composer Alexander Tcherepnin and grandson of composer Nicolas Tcherepnin. His younger brother Ivan Tcherepnin (1943–1998) was a prominent electroacoustic / experimental composer and the director of the Harvard University Studio For Electro-Acoustic Composition, and both his nephews, Stefan Tcherepnin (b. 1977) and Sergei Tcherepnin (b. 1981), also became composers. Tcherepnin was born in Issy-les-Moulineaux, and took first lessons in harmony from Nadia Boulanger. From 1958 to 1963, Serge had been studying with Leon Kirchner and Billy Jim Layton at Harvard University. In Europe, he received further training from Pierre Boulez, Herbert Eimert, and Karlheinz Stockhausen, as well as Luigi Nono at 1961 Darmstadt Vacation Courses. Serge Tcherepnin became a naturalized American citizen in 1960. Self-taught in electronic design and circuitry, Serge Tcherepnin started experimenting with 'junk electronics' at the early stage, making tape compositions with multiple DIY electronic noisemakers, repurposed transistor radios, etc. He worked at Studio für elektronische Musik der Musikhochschule Köln from 1966 to '68, and after that joined an Intermedia Program at New York University for two years. During that period, Tcherepnin wrote several compositions for 2-track/4-track tape, such as Two Tapes (Giuseppe's Background I–II) and Two More Tapes (Addition and Subtraction) in 1966, Quiet Day at Bach '67 for solo instrument and tape, and 'Hat' for Joseph Beuys (1968) for actor and tape. He also created a few multimedia works involving actors and non-music elements, including Piece of Wood / Piece of Wood with Weeping Woman (1967) and Film '67 for Baschet and traditional instruments, tape machines, 4-channel amplification, ring modulators, theater, stage, and lights. Serge composed music for convenient instruments too: piano composition For Ilona Kabos (1968), dedicated to Hungarian pianist Ilona Kabos, and Definitive Death Music '68 for amplified saxophone and chamber ensemble. Serge Tcherepnin began teaching composition and electronic music at the California Institute Of The Arts in the early seventies. It was a heyday of Moog, Buchla, and ARP synthesizers, and CalArts had a few studios equipped with Buchla machines. Those expensive and bulky instruments were in highest demand, kept under lock and key, and only established staff composers or someone skilled in the art of 'greasing the wheel' could get enough studio time with them. Around 1972, Tcherepnin with his students Rich Gold and Randy Cohen (2) established a People's Synthesizer Project, aiming to design and build a new modular synth, just as versatile and powerful as existing instruments on the market, but much more affordable. The very first modular systems were assembled at Tcherepnin's home, as a kitchen tabletop operation, but with an immediate interest and steady-growing demand from other professors and students, Serge soon organized an unofficial 'guerrilla'-style manufacturing operation at CalArts courtyard balcony, which mysteriously went unnoticed by the university officials, or somehow never bothered them. Prospective buyers were paying $700 upfront for components, and then soldered and built modules to get themselves a 6-panel synthesizer. 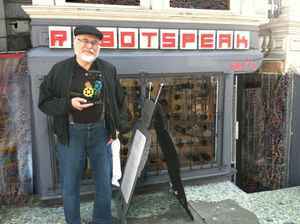 Even Morton Subotnick, professor and one of the founding members of CalArts, who had been closely collaborating with Donald Buchla on some fundamental aspects of synthesizer design in the early sixties, ordered some custom equipment from Tcherepnin, who went out of his ways trying to 'convert' a prominent Buchla evangelist to an emerging Serge camp. In 1974, Serge Tcherepnin left CalArts and established Serge Modular Music System (SMMS) company to manufacture his synthesizer full-time. He introduced a second generation of modules, available both as DIY-kits and pre-built instruments. Starting off a small factory on Western Avenue in West Hollywood area, SMMS relocated to a new location on Haight Street in 1980. Always driven more by enthusiasm and music making then commercialism, Serge Modular Music System was operated as a low-profile 'bohemian' enterprise, in a craftsman's workshop atmosphere. Inexpensive in comparison with Moog, Buchla, ARP and other synthesizers, Serge Modular was known for the flexibility, high sound quality, and relative compactness. Tcherepnin had been using color-coded 4 mm banana plugs for most connections – blue for control voltages, black for bipolar signals, red for pulse/gate signals, yellow for triggers. Both audio signal and control voltages were patched with the same cables that could be stacked. White front panel with minimalistic grid design and brightly-colored connectors became an essential element of Serge Modular iconic design, although a few exceptions were made. For instance, Serge Tcherepnin worked extensively on Malcolm Cecil & Robert Margouleff's legendary T.O.N.T.O. (The Original and New Timbral Orchestra) synthesizer, featured on several Stevie Wonder and Tonto's Expanding Head Band albums. Rex Probe, who was a TONTO technician at the time, met Malcolm in the early seventies at Electric Lady Studios in New York, when they had to program the bass line on the synthesizer to replace one band's bass player, who was too stoned to play in tune. In 1973–74, when TONTO was located at Record Plant, Los Angeles, Probe introduced Cecil and Kevin Braheny, who were constantly struggling to calibrate and track the colossal instrument with two Moog III inside, to Serge Modular system. Essentially, Serge and Rex designed a seminal New Timbral Oscillator module as an upgrade for unpredictable Moog oscillators inside T.O.N.T.O. To preserve a visual consistency of the instrument, all external modules by Serge Modular (and later Oberheim, Arp 2500/2600, EMS, Roland, Blacett, etc) were assembled under 'faux' Moog-style black panels. In the early eighties, SMMS also produced a third-generation Serge Modular for Darrel Johansen with a negative color scheme – silver graphics on black panel. This synthesizer was donated to CalArts in 1997. Around 1976, Serge Tcherepnin introduced a 3rd generation SMMS modules with a state-of-the-art schematics, highly accurate 1V/Oct oscillators, and high dynamic range VCOs (voltage controlled amplifiers), also featuring new low-noise filters. A standard range of synthesis modules was expanded with some esoteric audio signal processors, such as Wave Multiplier, a multipurpose slew / envelope module, and TKB (Touch-activated Keyboard Sequencer),a very flexible keyboard controller combined with analog sequencer. In 1979, a fourth generation of modules started to appear, and Tcherepnin introduced System 79, a complete pre-built synthesizer in standard configuration. An updated panel design was introduced, with paper stickers completely replaced by a metallized plastic film embossed directly on the metal. Apart from working on SMMS system, Serge Tcherepnin had been collaborating with other engineers, and worked with Frank Eventoff on Sonica and Rainmaker instruments. Even though Serge Modular was fairly popular among experienced and tech-savvy musicians and composers, by the mid-eighties market became very rough for modular synthesizers. Serge Tcherepnin practically stopped working on Serge Modular after 1983, doing various outside consulting projects to support his family. He closed Serge Modular Music Systems around 1986, and passed circuit designs and most equipment to a longtime associate Rex Probe. In 1992, Serge moved back to France. The business was re-launched in the early nineties by Rex Probe, who established a new company Sound Transform Systems (STS) in Hartland, Wisconsin and continued manufacturing existing Serge modules, as well as designing new ones. Instead of organizing his own firm, Serge Tcherepnin decided to license Serge Modular designs to various manufacturers, collaborating with them as a consultant. Since 2004, he worked with Ken Stone and his CGS company, offering Serge modules on PCBs (printed circuit boards) for an 'Arduino'-generation of today's DIY community. This collaboration further evolved in 2013, when Tcherepnin and Stone began working with Laurie Biddulph of Elby Designs on Serge modules with full-sized 4mm banana jacks in 3U format, thus bringing the full power of patch-programmability to the portable EuroRack world. A new 9-color coding system was presented, separately indicating inputs, outputs, and an additional 'special variant' for each of the major connection types: AC, DC, and Logic. In 2015, Random*Source in Germany started working with Serge Tcherepnin on the series of Serge modules, both in classic 4U and Eurorack formats, combining the original circuits with the advantages of today's technology. They've been using improved components, like THAT2180 voltage-controlled amplifiers, and also replaced manual wiring and soldering with SMT (surface-mount technology) workflow, while preserving an emblematic white panel design, and the look-and-feel of original knobs and banana jacks. Original modules from the seventies are still in high demand as well, with several individuals and small-scale synthesizer firms refurbishing old Serge Modulars. Serge synthesizers have been widely used by electronic composers, such as Michael Stearns and Kevin Braheny, described by Tcherepnin as 'one of the few true musicians that fully mastered the arcana of my synthesizer.' Kevin plays a highly-customized 15-panel 'Mighty Serge' system, initially built by him for Craig Huxley in 1977–78. Other notable Serge Modular users include film composer Gary Chang, who frequented Serge's place in the mid-seventies, Roger Powell, keyboardist for Todd Rundgren's Utopia, and composer John Adams. One of the first synthesizers built by Tcherepnin was used by William Jackson (4) during the first Greenpeace '75 anti-whaling expedition to emulate whale songs and broadcast distress signal to whales in the open Pacific. His brother Ivan Tcherepnin frequently used a custom-built Serge Modular for his electroacoustic compositions, including an award-winning Santur Opera (1982 Prix Ars Electronica). Stefan Tcherepnin inherited this instrument, and currently plays on it. A few composers wrote and perform pieces specifically for Serge Modular, such as Stereo Music For Serge Modular Prototype on Keith Fullerton Whitman's Multiples, and The Unattended Serge 1978 by David Chesworth.